You forgot to add the Chevy Monte Carlo.. We had a 73 with a horrid green on green color and swivel buckets !! The hood was like a mile long and the doors must have weight a ton a peice. That car is on another thread. This thread was for the full-size luxury sedans. The Monte Carlo is in the personal luxury coupe thread. Those swivel seats you mentioned was an option on those cars in 73'.... they were groovy! Wow!! The '72 Monaco Brougham and '73 have me just salivating!! I used to have a '73 Plymouth Fury III back in the early 90's, which I bought really cheap. It had the 360 2-barrel, and was a real powerhouse. I put some nice duals on it, so it sounded great. Wish I still had that car!!! Haven't even seen a 70's American car on the road hardly ever the past couple of years. Where have all of these cars gone?? Newer cars are good on gas and all, but so boring and wimpy. I miss the great old 70's iron!!! 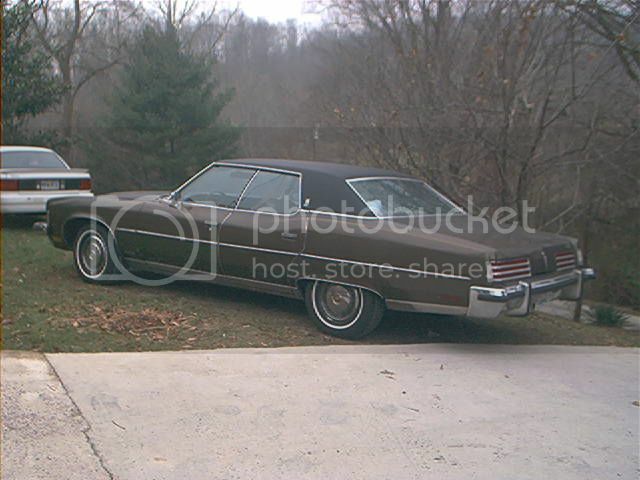 I just recieved a 73 buick electra 225 4-door i love this car thay have way more personality than 80% of the cars i pass i thought about selling it but have now changed my mind i am 26 years of age and when i get in this car i go back in time to relive an era that i never actually got to see. Yeah- hang onto it, I had a '72 Buick Electra back in the early 2000s that I regret selling. I am a 2 door guy. First car i owned was a 1971 Olds Cutless. Loved that car. One thing what I also loved about the Grand Ville's is they look pretty similar to the Buick Electra's yet they still distinctive looking vehicles, I didn't think much of the Bonneville's/Catalina's of the same era at all.